This flag is hung for all veterans to sign in the lobby at the eye clinic I go to. It's a large flag, 12 feet x 10 feet. Click on Download to see the many signatures! Wow...that's a lot of signatures. "Veteran" is not a permission slip. Nor is it a deed. By the virtue of your being a human being you do have the right not to be subservient to any liege, be it symbol or another person. There are many who proclaim patriotism loudly. But the real patriot does not expect any return for his/her service. Glad you served. Sad that you have not learned. I, too, am a veteran. The photo is not of a flag, but rather of a depiction of the America flag. The photo is well done. No one has the authority to sign the United States flag.. Writing on the American flag is clearly a desecration of the flag no matter how well intended. 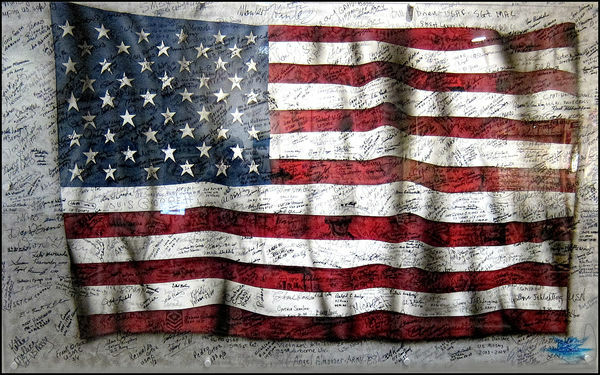 For all intents and purposes any flag given as a gift has already been signed--by the hundreds of thousands of soldiers and citizens who have given their lives and their very futures for it, beginning with the American revolution and continuing to this very day in Iraq, Afghanistan and around the world. we can't adjust our values , just because they make us feel good. doing the right thing is often more difficult than closing our eyes. "doing the right thing is often more difficult than closing our eyes." I'm guessing you are referring to "taking a knee" If that is considered a grand gesture what is it that do after taking this action? How and in what way are they involved in the remedy for their concerns? What do they do in the community to ensure success? Are there any programs they have a personal involvement in? You are very mistaken. When a symbol supersedes the principle it represents, the the principle is debased. No one owns the American flag regardless of signatures or sacrifice. To value less our descendants' service is not "doing the right thing". And yes, one can adjust values. You just did.